NetApp storage, much like ogres and onions, is made up of several layers. Regardless of using Data ONTAP 7-Mode or clustered Data ONTAP (cDOT), there are always aggregates which contain volumes which contain NFS/CIFS shares and/or LUNs. 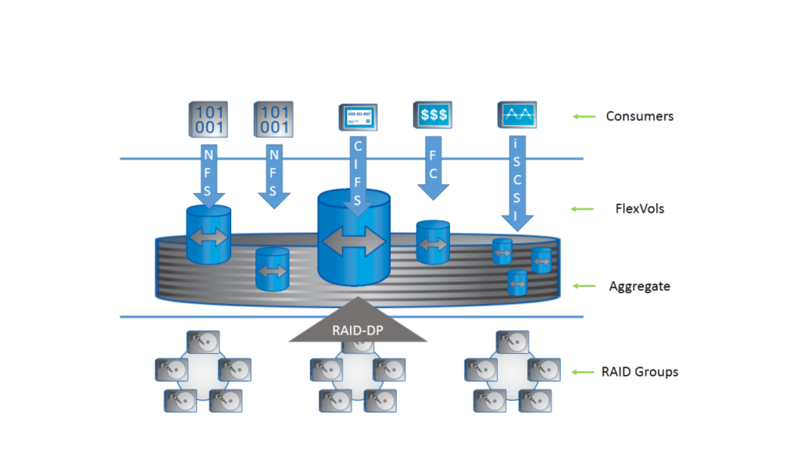 Aggregates are the physical grouping of disks into RAID groups on which all data is stored when using Data ONTAP, they are the foundation on which everything else rides. All of these components are configured similarly with both 7-Mode and C-Mode. C-Mode adds another layer of abstraction, known as the Storage Virtual Machine, which enhances data mobility and manageability on the storage array, but that does not affect the settings on the actual data container constructs. Each of these entities has configuration options and settings that can be tweaked, tuned, and adjusted for various scenarios. The defaults for these settings are conservative and capable of meeting a broad range of requirements, but they can also be changed to meet a variety of more specific needs for capacity, performance, ease of management, etc. Remember, just because a setting can be adjusted doesn’t mean that it needs to be. All environments are different, and there is rarely only a single “correct” way to configure your storage.